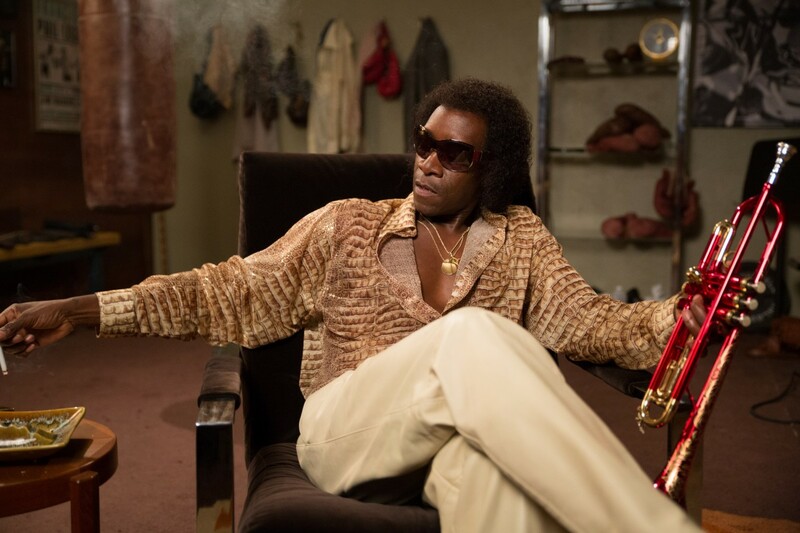 Don Cheadle’s Miles Davis biopic Miles Ahead is on release and Getintothis’ Del Pike tries to make sense of some of Cheadle’s strange choices while still enjoying the genius of Davis’s music. It’s so difficult to create a music biopic without playing out every cliché in the book. Don Cheadle’s tribute to jazz genius Miles Davis tries to avoid this but by default delves deeper into the cliché handbook. Davis, the trumpet master who on a good day was more rock and roll than Mick and Keith combined, is presented here as a semi-fictional coked-up gunslinger on the road to destruction. In placing Davis in a fictional situation with an equally fictitious Rolling Stone Magazine Gonzo journalist Dave Brill, played with aching discomfort by Ewan McGregor, Cheadle succeeds in producing something of a comedy caper. With a missing tape storyline as feasible as Paul McCartney’s Give My Regards to Broad Street, much of the action dissolves into something akin to an episode of Starsky and Hutch meets Lady Sings the Blues. After forcing himself into Davis’s house during his late 70s retreat into Howard Hughes style reclusiveness, and virtually stopping at nothing to get the dope on him for that all important feature, its buddy movie time! It is clear that this adventurous distraction is meant to reflect the musician’s state of mind, but it would have fared better as a straight to the letter biopic. However, this is not a bad film and Cheadle’s decision to not only write and direct but also play Miles Davis works when he steers away from the clumsy slapstick subplot. There is much for jazz fans to enjoy, mainly in the flashback sequences that chart the rise of Davis, his romance and his eventual marriage to the dancer, Frances Taylor (Emayatzy Corinealdi), where we hear many of the tunes that made him the legend he is. Alongside Cheadle’s impeccable performance- which highlight McGregor’s shortcomings- the music is the money here. Cheadle has written additional tunes alongside such timeless pieces as So What and Solea which seamlessly drift throughout the soundtrack. Those familiar with Mario Van Peebles’ Sweet Sweetback’s Baadasssss Song (1971) will surely draw comparisons here. Van Peebles similarly took the helm as writer, director and lead actor, and Cheadle undoubtedly pays homage in fast blurry jazz enhanced chase sequences with cutaways of writhing bodies and psychedelic lights. The continual nods to Blaxploitation cinema are understandably unavoidable considering the subject matter and the 70s setting, but the grainy quality of the film and Davis’s rocky relationship with Frances Taylor are strongly reminiscent of Larry Cohen’s Black Caesar from 1973 and the buddy caper aspect recalls Hell Up in Harlem, also by Cohen from the same year. Roberto Schaefer’s cinematography is beautiful and in the flashbacks of Davis in the studio, the atmosphere of those wonderful shots that adorn the back covers of many a jazz album is captured with absolute clarity. Cheadle looks stunning in his skinny tie period, terrifying in his spaced out kaftan era and the close up style that Schaefer employs for most of the film lends itself to the claustrophobia and paranoia which Davis experienced at the time. Credit is due also to editors John Axelrad and Kayla Emter who use some of the most impressive transitions from one era to the other which, at times, jolt you from your seat. Miles Ahead has been billed as an exploration of the life and music of Miles Davis, and while it’s certainly an affectionate portrayal of Davis at two pivotal points in his life, it really doesn’t deliver its promise. It is worth the ticket price to see Cheadle act his heart out, take on the role he was clearly born for and to hear some great music, but if you are looking for insight into the mind of the great man, go and read a book.